I have the following G1 FAL and Israeli FAL parts for sale or to trade for the FAL parts that I need (trading list is at bottom of thread). If buying, payment is via US Postal Money Order or discrete Paypal with added 3.5% (NO mention of guns / parts AT ALL). Prices does not include shipping or insurance. First "I'll take it here "followed by a PM with your preferred payment option, gets the parts. I'll take it #6 Izzy repop spacers - both for $20 plus shipping. PM me total and I will send a USPS money order. Email sent on G1 handgaurd set #1. Sorry for the goof. Prices are in ad now. G1 handguard set is yours if you want it. E-Mail replied to. Trade accepted (pending pictures) plus $14.13 for shipping and PP fees. Number G1 flash hider NOS unopened is yours. Total with shipping USPS Priority Mail flat rate is $37.20. Please send me your address and how you want to pay. PP Goods and Service will incur an extra 3.5% fee. They are yours. I'll mark them SOLD PENDING FUNDS and will give you a shipping quote shortly. Shipping and insurance quote was sent to you via PM. Last edited by raexcct2; July 12, 2018 at 16:27. SET 2. 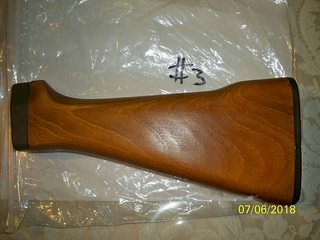 NOS metal but has storage marks / scratches on parkerized finish, NOS wood-$30. You don’t happen to have a set of Brit pebble handguards? Set #2 is yours, PM and email sent with payment information. Last edited by raexcct2; July 15, 2018 at 03:15.
if it’s still available . Last edited by toro_dog; July 17, 2018 at 06:35. # 5 G1 flash hider is yours. Last edited by raexcct2; July 17, 2018 at 08:21. Set # 2 Israeli heavy barrel handguards is back up for sale. Member mistook it for light barrel handguards.